S&P/Case-Shiller released the monthly Home Price Indices for February ("February" is a 3 month average of December, January and February). 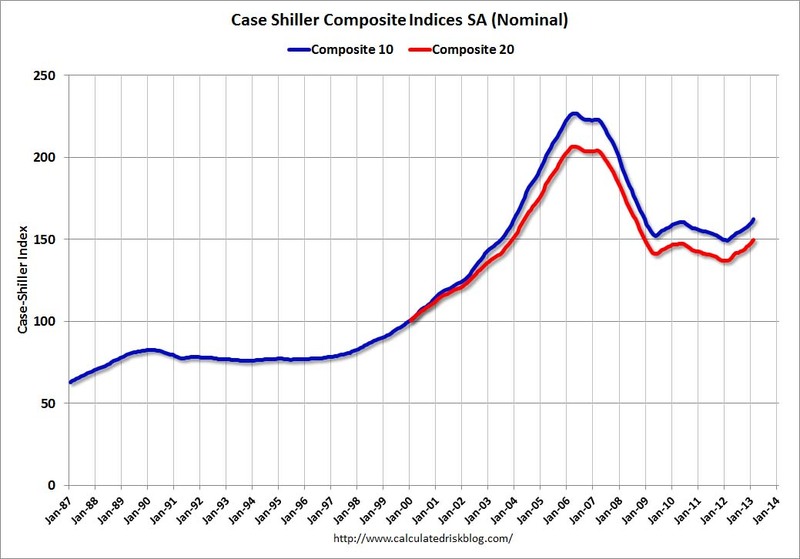 Data through February 2013, released today by S&P Dow Jones Indices for its S&P/Case-Shiller Home Price Indices ... showed average home prices increased 8.6% and 9.3% for the 10- and 20-City Composites in the 12 months ending in February 2013. The 10- and 20-City Composites rose 0.4% and 0.3% from January to February. “Home prices continue to show solid increases across all 20 cities,” says David M. Blitzer, Chairman of the Index Committee at S&P Dow Jones Indices. “The 10- and 20-City Composites recorded their highest annual growth rates since May 2006; seasonally adjusted monthly data show all 20 cities saw higher prices for two months in a row – the last time that happened was in early 2005. “Phoenix, San Francisco, Las Vegas and Atlanta were the four cities with the highest year-over-year price increases. Atlanta recovered from a wave of foreclosures in 2012 while the other three were among the hardest hit in the housing collapse. At the other end of the rankings, three older cities – New York, Boston and Chicago – saw the smallest year-over-year price improvements. The Composite 10 index is off 28.4% from the peak, and up 1.2% in February (SA). The Composite 10 is up 8.6% from the post bubble low set in Feb 2012 (SA). The Composite 20 index is off 27.5% from the peak, and up 1.2% (SA) in February. 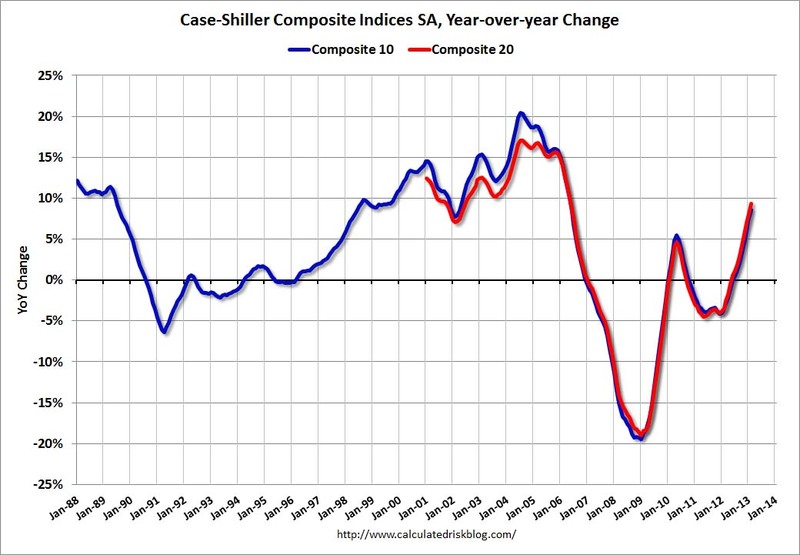 The Composite 20 is up 9.4% from the post-bubble low set in Jan 2012 (SA). 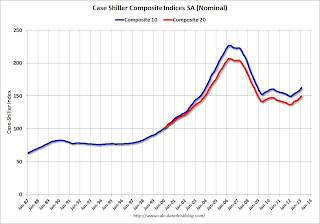 The Composite 10 SA is up 8.6% compared to February 2012. The Composite 20 SA is up 9.3% compared to February 2012. This was the ninth consecutive month with a year-over-year gain and this was the largest year-over-year gain for the Composite 20 index since 2006. 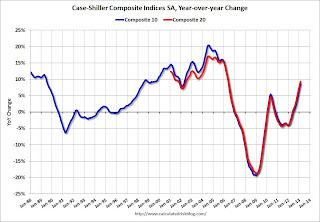 Prices increased (SA) in 20 of the 20 Case-Shiller cities in February seasonally adjusted (prices increased in 12 of 20 cities NSA). Prices in Las Vegas are off 55.0% from the peak, and prices in Denver only off 1.0% from the peak. This was just above the consensus forecast for a 9.0% YoY increase. I'll have more on prices later.